I tried the fresh brewed option this past week. I didn’t get the results I wanted (obvious Thai ice tea flavor), but the cupcakes were still really tasty. I had gotten some good suggestions for sweetened condensed milk frosting from my last experiment. I whipped something up and was happy with the results. I will use it for my Vietnamese Coffee Cupcake which I will work on next month. The cake: Similar to the first test, the cake was tasty, but not very Thai ice tea flavored. One taster said it tasted like it had corn in it, which it didn’t. 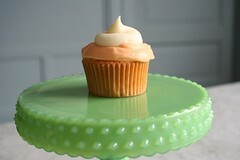 The frosting: I had some frozen Thai ice tea cream cheese frosting left over from the last test. Tasters really liked it, so I decided to do a layer of that topped with the sweetened condensed milk buttercream frosting. I really liked the way the two layers looked and I think the flavors worked well together. NOTE: I would be lost without this book, In The Sweet Kitchen: The Definitive Baker’s Companion. Its thorough substitution chart is invaluable when swapping out ingredients. How long did you brew your ice tea for? You have to brew it for a while and steep and resteep, at least that’s how my family does it. Will definitely try that recipe when we have some next time! It’s actually Thai Ice Tea not Chai. Thai Ice Tea is the orange stuff you get at Thai restaurants. Thanks for the tip though, I may try a chai tea cupcake at some point. I don’t know how exactly you made the tea, but if you went per the instructions on the page you linked to you might want to skip the “add water” part? That should give you a much stronger tea. Maybe adding more leaves and/or less water might also help. Good ideas for sure. I will need to try the recipe again soon. I should really provide measurements in grams and ounces… That is impolite of me. isn’t thai tea made of star anise? maybe try using that instead. I know this is super outdated, but if anyone still checks this….we steep our thai iced tea for 6 hours. So, you might try that. You’ll get an authentic thai tea flavor for sure!